While a car’s paint job and license plate may change, a vehicle identification number is intended to be a means of permanently identifying all vehicles on the road. Auto insurers, dealers and law enforcement all rely on the ability to positively identify a vehicle using its unique vehicle identification number (“VIN”). As a result, tampering with a vehicle identification number is a serious crime pursuant to California Vehicle Code Section 10802 VC and conviction under this statute can carry significant penalties. The defendant knowingly altered, counterfeited, defaced, destroyed, disguised, falsified, forged, obliterated or removed a vehicle identification number. AND the defendant intended to misrepresent the identity or prevent the identification of motor vehicles or motor vehicle parts for the purpose of sale, transfer, import or export. 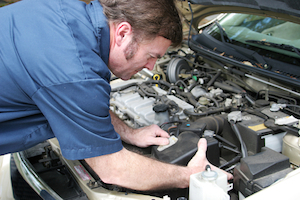 A man operates an auto body shop. One day the man is approached by a new customer who wants him to get rid of all visible vehicle identification numbers on his automobile. The body shop owner is highly suspicious; however the customer is offering to pay him double his usual rate. The body shop owner agrees to help the customer and removes the VIN information using industrial sanders and corrosive acids. The body shop owner could be prosecuted for tampering with a vehicle identification number in violation of California Vehicle Code Section 10802 VC. In another example, a man owns an auto wrecking lot. He is licensed and authorized to destroy cars and turn them into junk metal. When destroying the cars in the compactor, the vehicle identification numbers on the vehicles become completely obliterated. This man would not be criminally liable under California Vehicle Code Section 10802 VC because he did not destroy the vehicle identification numbers in order to prevent identification of the vehicle or advance a fraud. As described above, the defendant must have intended to misrepresent the identity or prevent the identification of the vehicle when he or she tampered with the vehicle identification number. If the defendant had no such intention, he or she would not be guilty of this offense. In addition, there may be circumstances in which a person inadvertently defaces or alters a vehicle identification number when using corrosive substances or other similar products while working on or cleaning their vehicle. In these cases, the defendant would have a strong accident defense if charged criminally. Tampering with a vehicle identification number is a “wobbler” offense that can be charged by prosecutors as either a felony or a misdemeanor. When making any filing decision, prosecutors will evaluate a number of factors including the defendant’s criminal history, if any, and whether or not the defendant was involved in a larger auto theft ring or scheme. If charged as a felony, the maximum sentence that a defendant can receive is three years in prison. If charged with a misdemeanor, the defendant may face up to a year in jail in addition to a $1,000 court fine. If you have been charged with tampering with a vehicle identification number, it is very important that you get in touch with an experienced Los Angeles Criminal Defense Lawyer as soon as possible. Los Angeles Criminal Defense Attorney Michael Kraut is a former Deputy District Attorney with over 14 years of prosecutorial experience who has significant exposure to fighting cases like this, both as a prosecutor and as a defense attorney. Mr. Kraut knows how to effectively defend those charged with this offense and fights hard on behalf of his clients. For more information about tampering with a vehicle identification number and to schedule your free consultation, contact Los Angeles Criminal Defense Lawyer Michael Kraut at the Kraut Law Group located at 6255 Sunset Boulevard, Suite 1480, Los Angeles, CA 90028. Mr. Kraut can be reached 24/7 at 888-334-6344 or 323-464-6453.